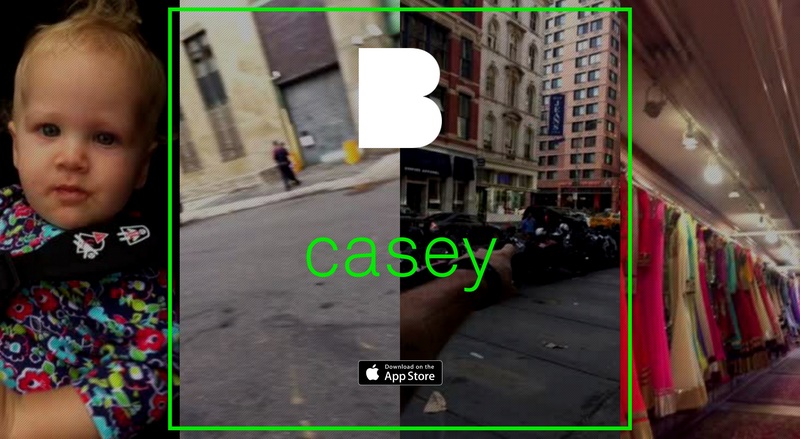 Beme is a new video-sharing platform launched by Casey Neistat, a popular film director that recently reached 1 million subscribers on his YouTube Channel. In the App Store, the following about Beme is described: “The simplest and most authentic way to share your experience on video. Instantly capture around you with a simple gesture and without interruption”. Together with Matt Hackett, former vice president of engineering at Tumblr, Casey created an app to share videos without looking at the phone. Beme users can make short videos by simply covering the proximity sensor of the phone. In this video Casey shows how he is recording by simply holding it against his chest. When this happens the phone beeps, vibrates and the screen goes black. The app removes the possibility to look at the screen or yourself when filming. Beme claims that this ‘allows’ the user to experience the world more directly. There is no preview or ways to edit the footage. Once the recording is done, it’s posted and shared. With Beme users can quickly capture and share videos without disturbing the ‘real’ experience when filming. But does this same authentic experience can be found in the content? Can I establish a true version of myself (or be me) for other Beme users? Therefore I would like to focus on the content that the users produce. And I would like to examine in which ways Beme videos distinct from other social media content in terms of authenticity. First of all, the visual look of the app is really simple and straightforward. In an article for The New York Times Mike Isaac writes that removing all features, that are included in today’s most popular social apps, was part of Beme’s strategy. Beme is at its core, a grey and black list of friends. It is similar in look and feel to a command line prompt from computer software’s earlier days. Different than all other social media, users of Beme are not suppose to stare at their screen while using it for filming. In her article for The Washington Post Caitlin Dewey describes that Beme serves a ‘real purpose’. It helps reestablish this fiction of authenticity that’s been threatened by Facebook and other social networks. Beme can also be used as way to express ‘authenticity’. By using Beme, instead of some other app, you tell your viewers you don’t really care about “all this”. Beme users can take on an apathetic or careless attitude towards all the other mainstream social platforms. Dewey writes that “It’s the apathy that makes you look authentic”. In his book on video theory Andreas Treske describes how authenticity can be constructed in video footages captured with mobile phones. Vertical filming and shaky camera images can refer to act of an amateur (134). Beme is designed to hold the phone in vertical position and use it that way. And because users can’t review on their videos, some of the raw and unedited footages are shaky and not well made. Also the videos captured in Beme are low quality. In his article Eddy Borges-Rey describes that the presence of pixels and poor technical quality of images can make content seemingly more authentic (576). Another thing I would like to point out is that Beme videos are limited to just four seconds. When Beme users make several short videos in a row, all videos will be put together in one footage. Once displayed, you’ll see all these ‘raw videos’ at once put together with abrupt cuts. It’s the short videos and cuts that make this content more ‘spontaneous’. In an article for Wired, Vanhemert describes that Beme’s design was pretty radical. It’s one of the few smartphone apps with functionality built around the idea of limiting how much of our experience is mediated by our smartphone. He eventually states, “for most of us, authenticity is boring”. Not everyone’s everyday live is as interesting as Neistat’s. It’s filters that make our lives look extraordinary. This same appeal holds true for many of today’s most popular social apps. He also states that life is usually more interesting when it’s edited and scrutinized before being rebroadcast. Beme users are not able to produce visually sculptured content that is attractive. That’s why, according Vanhemert, Beme has a ‘problem’. Meanwhile Neistat doesn’t seem to worry too much. He says the authenticity that this app offers will be incentive enough to win over a community eager to broadcast their lives in a different way. If this is the case, the interesting question will be: Will these unscrutinized raw images of Beme affect the contemporary visual culture? And maybe form new kinds of aesthetics? Borges-Rey, Eddy. “News Images On Instagram.” Digital Journalism. 3.4 (2015): 571-593. Dewey, Caitlin. “Beme wants to be the app for social media ‘authenticity’. Too bad there’s no such thing.” The Washington Post. 28 July 2015. 14 september 2015. Treske, Andreas. “Beyonce Vertical.” Video Theory: Online Aesthetics on the Afterlife of Video. Bielefeld: Transcript Verlag, 2015. 133-150. Vanhemert, Kyle. “Beme Has a Problem: Authenticity Is Boring.” Wired. 21 July 2015. 14 september 2015. « The Pencil is a Problem.